1. Prince's self deprecating sense of humor. She reveals a lot about herself in this book. She is into bearded guys who wear hip band shirts. She is not a girly girl. She is particular about her likes and dislikes. And she is sometimes awkward. Still, I find her antics hilarious. 2. How she throws herself under the bus. Even though she is the protagonist of her own stories, she does not always cast herself in the best light. She is frequently blunt and offensive, and I love her sense of confidence while she takes potshots at herself. 3. Her sense of comics. Although these various entries are somewhat sketchy sometimes, they also show a great awareness of how comics work. Her storytelling is clear, and she's got excellent comedic timing. 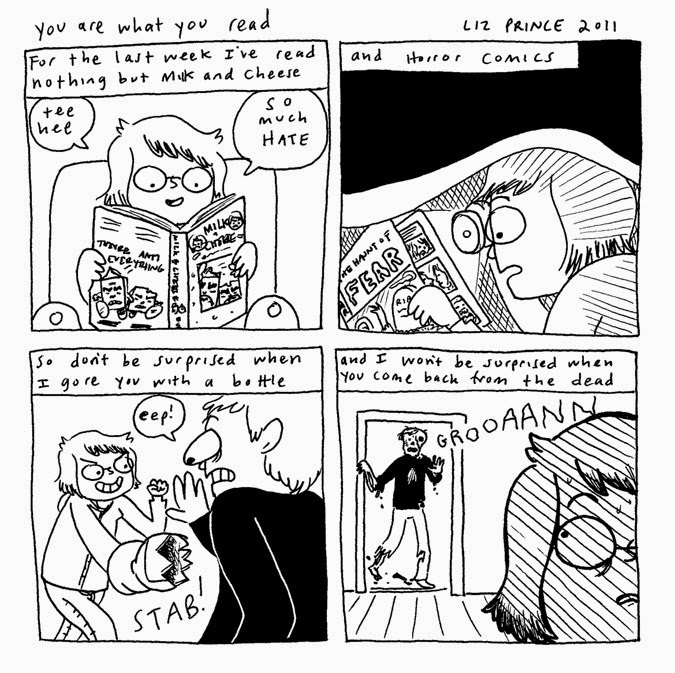 Prince is deceptively crafty, and I think she makes very accessible, fun, and funny comics. Prince has a few other collections available, including the Ignatz Award winning Will You Still Love Me if I Wet the Bed? and Delayed Replays. She also published a graphic memoir Tomboy, which was named a Best Teen Book of the Year by Kirkus Reviews. She speaks more about her work on Alone Forever in this interview. All of the reviews I have read about this book have been positive. Colleen Frakes wrote, "Her art has improved with each book, but in this one she's really nailed it with a cute, spare style." Greg McElhatton suggested, "Leave Alone Forever on your coffee table and I promise you, before long you'll hear chuckles and groans of recognition as your guests start leafing through it." Matt D. Wilson added, "The gags make readers laugh in the moment, but there are insights that stick around long after the book goes back on the shelf." Alone Forever was published by Top Shelf, and they have a preview and much more here. There are frequent profanity and adult situations in this book, so it is suggested for readers mature enough to handle both. 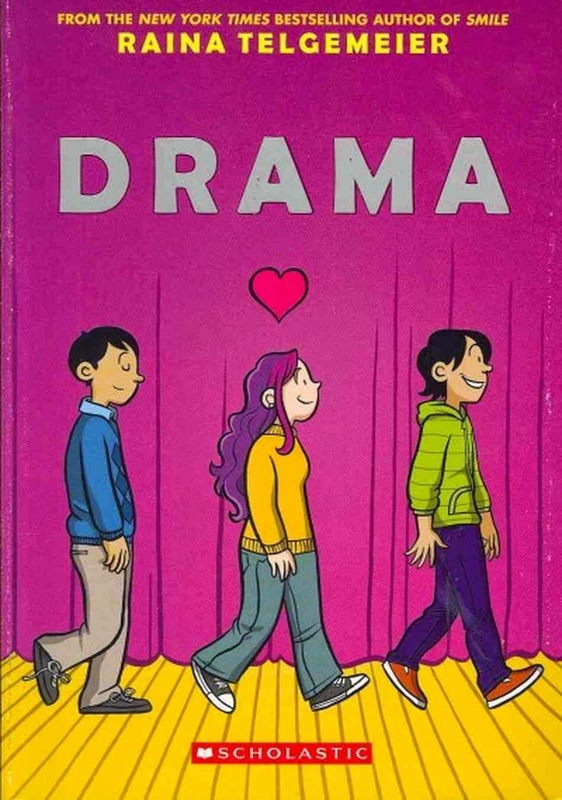 I really enjoyed Raina Telgemeier's last book, the multiple award winning Smile, so I was very much looking forward to reading this book, Drama. 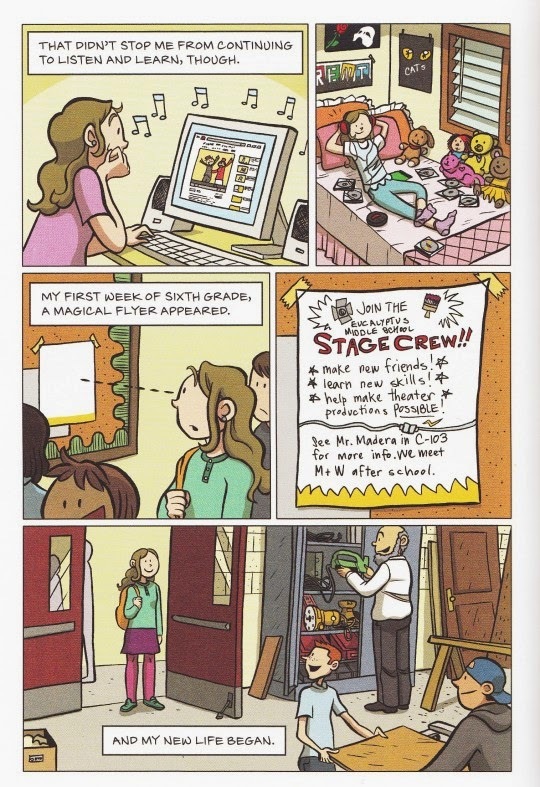 It focuses on the goings on in a middle school theater club. The title has at least two meanings, the first being that the story focuses on the technical aspects of putting on a school musical. The main character is Callie, the set designer of the show, and we get to see her several challenges, including working within a budget, making and moving sets, and getting a special effects cannon to work. 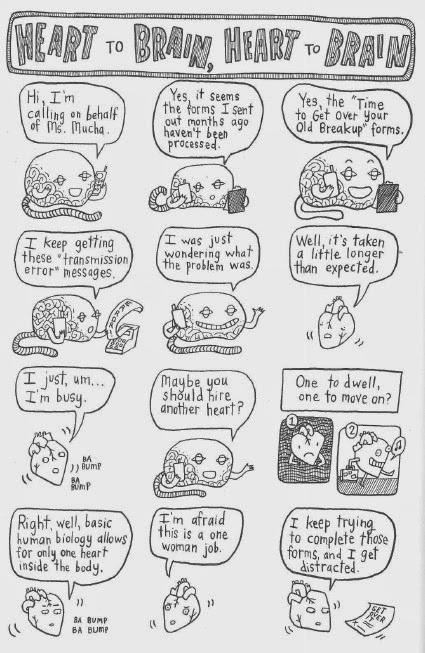 I was in one musical in high school, and I have to say that I could relate to these aspects of the book. The second meaning of the title has to do with the interpersonal relationships between cast members and the school at large. Not only do we get to see the politics of a demanding leading lady and how all the other actors have to deal with various obstacles, we also get a look into Callie's relationships and crushes. There are a couple of brothers, Greg and Matt, with whom she has grown up, who clumsily court her. Life gets further complicated when newcomers Justin and Jesse come to this school. Justin comes out as gay to Callie pretty early on, and he is very interested in being a performer in the show. Justin is more reserved and a wildcard, and Callie starts hanging out with him and develops feelings. I don't mean to make Callie just seem boy crazy, because she is more complex than just that, but she is caught up in the vortex of figuring out how romance works. 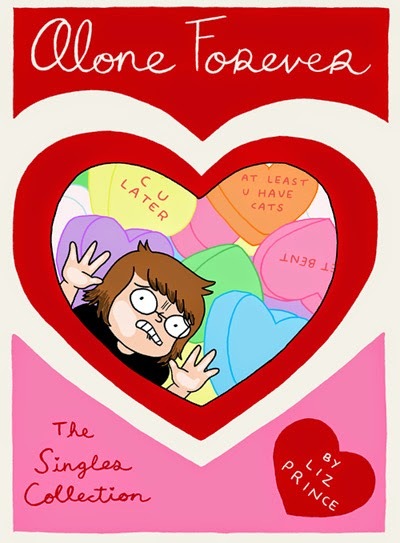 Overall, I felt that Telgemeier did an excellent job getting at how confusing, awkward, and hopeful middle school relationships (in terms of both romance and friendship) can be. 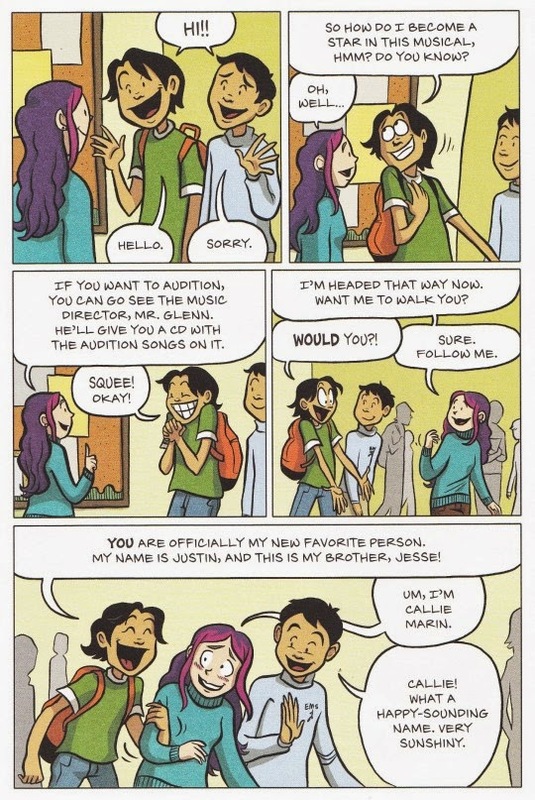 As you can see from the excerpts above, Telgemeier's art style is very attractive and colorful. I feel that it is deceptively simple looking, as she is able to convey much emotion and action with relatively few lines. Also, she is adept at varying her presentations at times, with some scenes being more large montages and other more focused on specific exchanges. My one quibble really is that at times I felt there was a little too much exposition in the text, but those instances were few. I understand that some of the personal issues of sexuality that come up in this book have made it controversial in some places, to the point of it being removed from libraries, but I did not feel that there was anything prurient here and that these situations seemed very realistic and human. I feel more and more issues of sexuality are coming to the fore in young people's lives, and those are better discussed than ignored or shunned. That certainly seems to be the tenor of this group of young people who discussed the book as part of the YALSA Hub Challenge. Eti also has a well detailed defense of the book in this blog post. Drama has received its share of accolades and was named a Stonewall Honor Book and a Harvey Award Nominee. Ada Calhoun had many positive comments about the story and artwork: "Telgemeier’s momentum-building visual style veers from leisurely montages during rehearsals to dramatic moments like the sharp half-page describing a disaster on show night." Kirkus Reviews gave it a starred review and summed up, "With the clear, stylish art, the strongly appealing characters and just the right pinch of drama, this book will undoubtedly make readers stand up and cheer." Publishers Weekly also gave it a starred review and concluded, "Telgemeier’s manga-infused art has some moments of heartache, but the generally cheerful and affirming story should be eagerly devoured by her many fans." There is a book trailer and much more info on the author's official page. A preview is available here from the book's publisher, Scholastic. When it comes to comics and graphic novels, there are a couple of areas that stick out as places where there might not be so many great resources. One of those is in the area of mathematics, and another is in books for early readers. Mental Floss has a good write-up here for books for those children/students. Power Lunch: First Course is an interesting take on superheroes for younger readers. 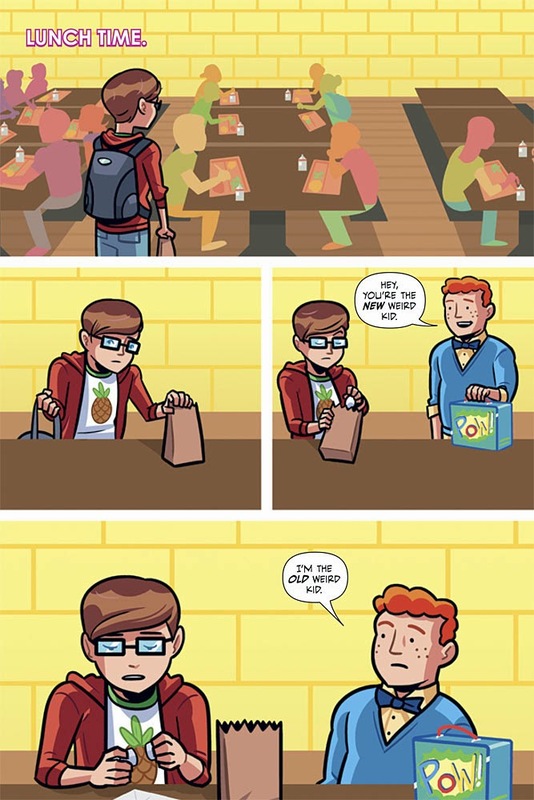 It stars a boy named Joey who is the new kid in school and looks a little bit like Clark Kent. 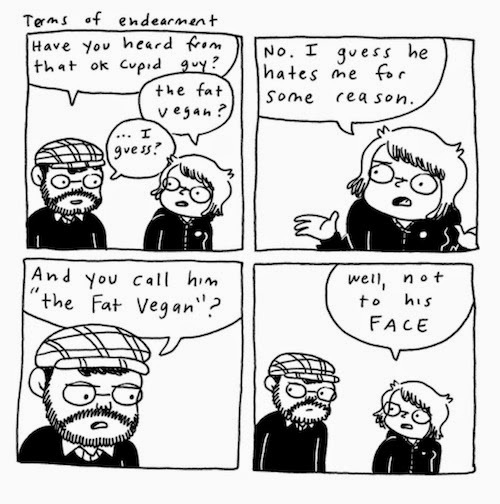 He as strange dietary restrictions, and is only allowed to eat foods that are white. He meets and befriends Jerome, who used to be the new, weird kid and looks a little like Jimmy Olsen. He is bullied by a taller boy named Bug, and one of the main plots of the book is about how the duo deal with him. The plot twists when Joey eats some trail mix (which is not white) and manifests superpowers. It turns out that whenever he eats other foods, he gains different sets of powers. These powers comes in handy when dealing with a bully, but they also might give him a leg up when he tries out for the soccer team (see what I did there? HA!). That last bit raises an ethical quandary about using his abilities, which will get taken up in the second book, aptly named Seconds. For the most part, I found this book pretty enjoyable. The artwork is clear and bright, and I feel that the story is pitched well to children without being condescending. Its depictions of bullying seemed realistic and upsetting, which is appropriate. But there was one aspect that also bothered me about the ending. It seemed abrupt to me and also troubled me because Joey decides to use his powers to scare the bully into behaving. I know that the message may be to take up for yourself and also to stand by your friends, but I also was left with the impression that Joey is sort of a bully himself with how he handled the situation. Maybe this point also gets addressed in the sequel, but I felt it was a strange way to end things here. This book is a collaboration between writer J. Torres and artist Dean Trippe. Torres has written a number of comics aimed at younger audiences, including the Jinx series and Alison Dare stories, as well as the autobiographical The Copybook Tales, and a number of titles for the big two comic book companies. 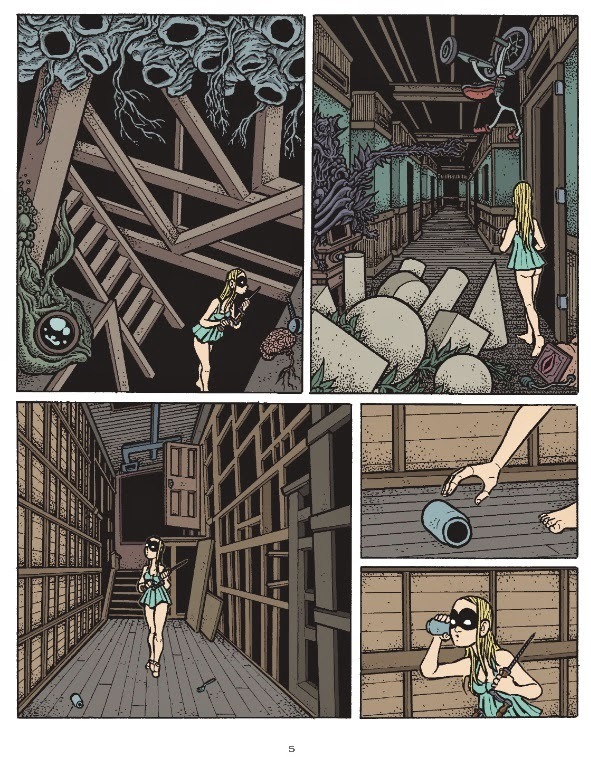 Trippe is known for his webcomic Butterfly, his work with the website Project: Rooftop, and his autobiographical comic about dealing with sexual abuse Something Terrible. 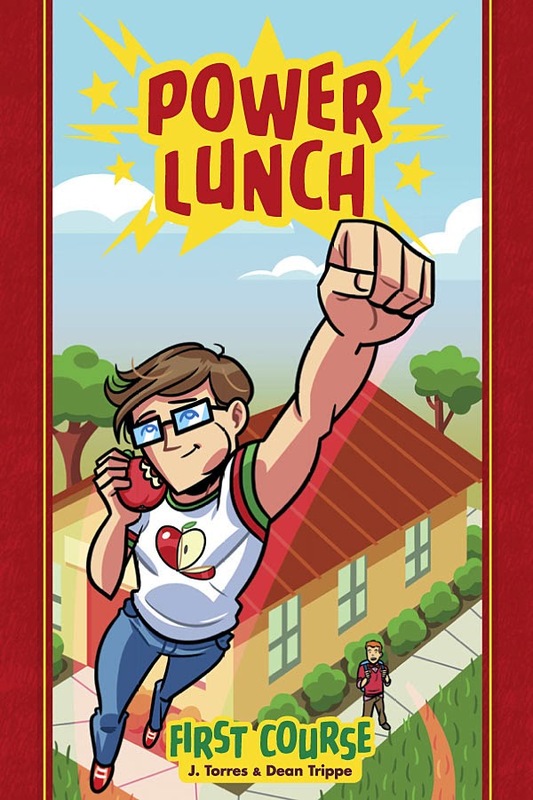 Power Lunch is published by Oni Press. Comic Book Resources offers a preview here. 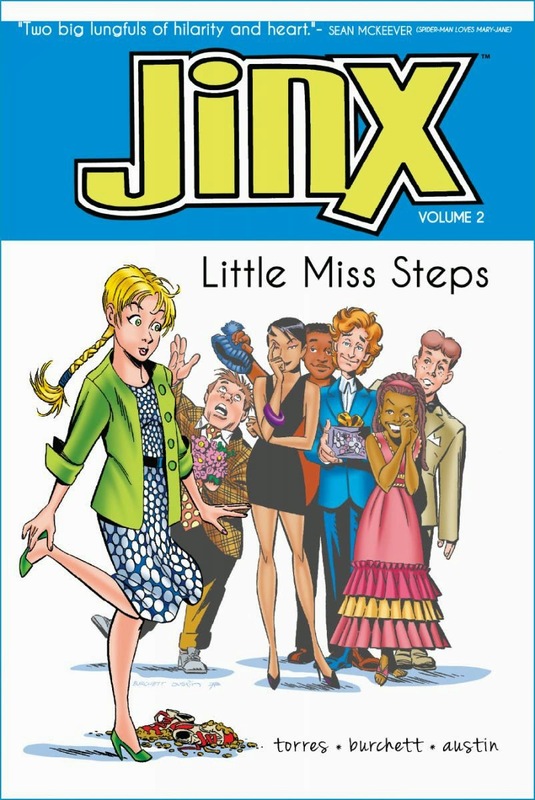 Little Miss Steps is the second volume of Jinx, which is a young adult update of Li'l Jinx, a classic Archie back-up character. I loved the first volume, and this one is a worthwhile follow-up. The plot revolves around three major points: Jinx is having a tough time with her mother, there are baseball/softball tryouts, and there is a big dance coming up. Jinx hardly seems to see her mom, who is divorced from her father, because she works so much, and this absence is wearing on her. Part of the reason why is that her mom has a huge issue to talk about with her, and (SPOILER COMING) she does not know exactly how to broach the issue that she is a lesbian with her daughter. I appreciated how well, sensitively, and realistically this whole conversation played out in the course of the book. Not everyone was OK with the situation, and they, the children and the adults, have multiple reactions. There were no pat answers, and in the end I liked how the various characters reacted to each other. The other two issues in the plot are more minor, for sure, and act as YA subplots dealing with sexism, school politics, and young romance. The Jinx-Charlie-Greg triangle is still going strong, and it is refreshing to see young people who obviously care about each other but do not know exactly how to take each other interact. They make mistakes, are frequently clumsy, and seem like genuinely good people. Plus, there are lots of humorous situations along the way that make the story enjoyable. This book was created by the same team as book one. Writer J. Torres has created various wonderful comics in the past, including the autobiographical The Copybook Tales, adventure stories starring Alison Dare, and other comics for the big two comics companies. Eisner Award-winning artist Rick Burchett is known for his work on Batman and Superman Adventures. Inker Terry Austin has worked with almost every major artist at every big company and is probably best known for his run on Uncanny X-Men. Their artistic collaboration is expert, accomplished, and it suits the tenor and tone of the story well. All of the reviews I have read of this book have been complimentary. John Hogan wrote, "Everything plays out in a realistic manner without ever condescending to the reader, and Torres deserves credit for never missing a beat with the humor and levity that define these stories." Win Wiacek offered this praise, "Compellingly funny, gently heart-warming and deftly understated, this is book that will certainly resonate with kids and parents, offering genuine human interactions rather than manufactured atom-powered fistfights to hold your attention." 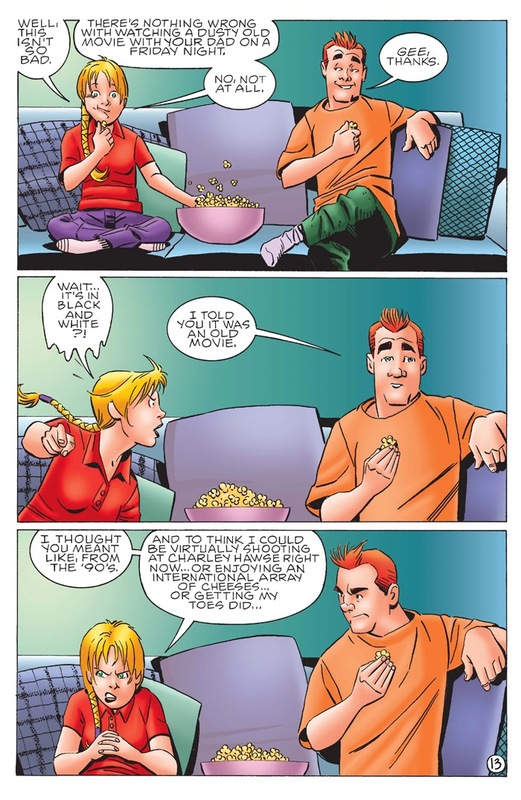 Brian Cronin summed up his review, "It’s a great comic work and I hope Archie keeps making ‘em." Sadly, I have to say they have not yet offered another follow-up. Jinx: Little Miss Steps was published by Archie. Comic Book Resources offers a preview here. Reading with Pictures is a non-profit organization started by comics creator Josh Elder, who is known for his work on Mail Order Ninja. He, like me, thinks that comics are very engaging and found comics to be a large part of his diet when he was learning to read. 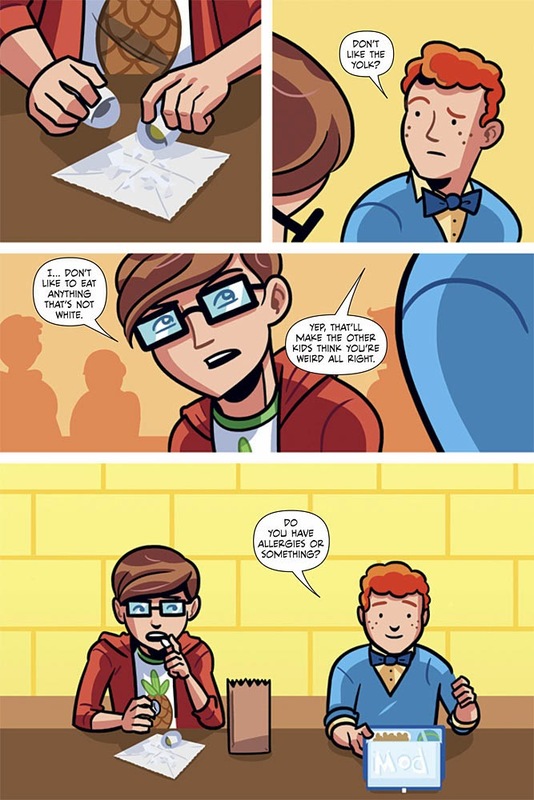 He is seeking to make connections between comics and learning standards, and one of his projects is to make a textbook composed entirely of comics, which is what we have here. This volume was funded in part via a Kickstarter campaign, and it contains a number of comics stories sorted by content area. Being that I am an educator by trade, and that I am a reading education person to boot, I am pretty much inclined to like this book. 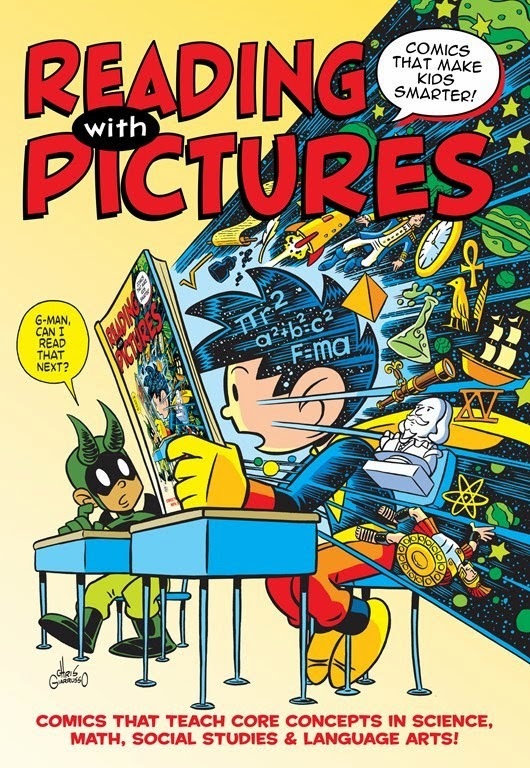 I have to say though, I am not thrilled with the tagline, "Comics That Make Kids Smarter," pretty much for the argument Tim O'Neil made when talking about books. Reading itself does not make a person smarter, but it is the content of the material, whether it be stories, nonfiction descriptions, or otherwise, that engages people and helps them think and perhaps amass some background knowledge through the process. And some books are better than others at doing those things. 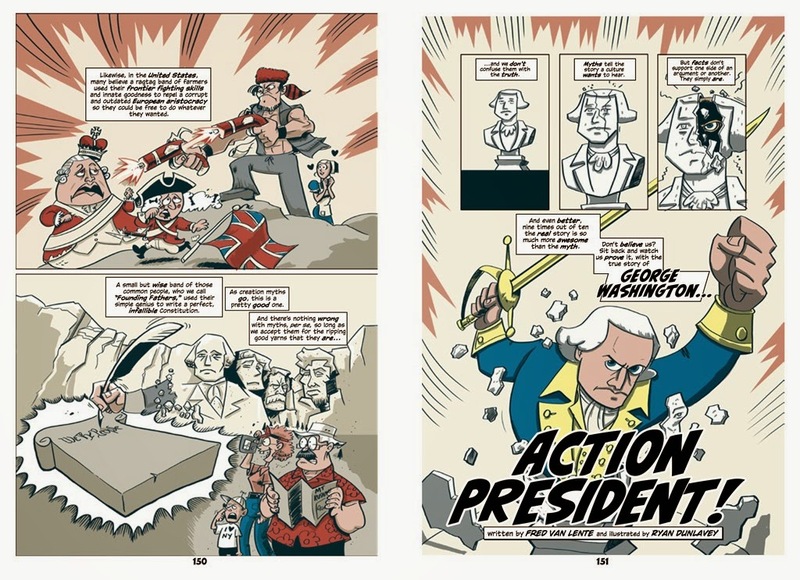 I am a sucker for Van Lente and Dunlavey's work in the past, and their "George Washington...Action-President!" entry was no disappointment. I felt it offered a measured look at a vastly important historical figure that offered a complex picture of the man, warts and all. Additionally, I had never read Chris Schweiser's Crogan Adventures until "The Black Brigade" tale offered here, but I will need to dig into some more soon. His account of Colonel Tye and a brigade of freed slaves fighting during the Revolutionary War was absorbing, dramatic, and very well rendered. I have to say I was excited to see a mathematics section, because there are so few engaging and informative graphic novels about math, but I felt let down by these entries. One of the big problems I had with the book is characterized in the math story "Probamon" by Geoffrey Golden and Nathan Pride. 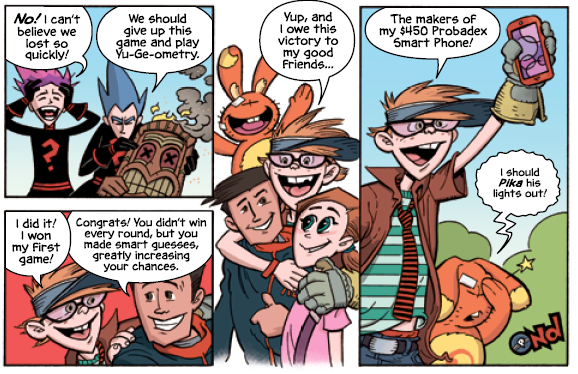 It is a parody of the formerly ubiquitous Pokemon, and the jokes are pretty juvenile, mostly puns and poking fun at the protagonists (and I am OK with those, given the audience). But the danger of popular culture references such as this one, and they are pretty frequent in this book, is that they become quickly dated. I actually was amused by this story and I found it likeable enough, but I wonder how students five years from now might take it, or if they would even get the references. The story relies on the assumption that the reader knows how the game works and also that the reader can relate the concept of probability to its rules. So if such connections are not made, I wonder how successful or potentially bewildering this story might be. Other stories in this book were less successful, for a variety of reasons. Some I felt were uninteresting in how they presented information, like comics stories with information thrown in. Some felt very pedantic and leaden in their delivery, like boring lectures. I know this book is aimed at elementary readers, but they can handle relatively complex information if it is presented in interesting ways. In the end, I felt that there were a couple of really great, engaging, and informative stories mixed with a bunch of tales full of clunky exposition and a few I felt were a waste of time. The biggest problem with this book is the problem with most textbooks: it tries to do too much. There are some factual and editing errors; the content seems thin and forced in most stories; and overall the book is inconsistent. I love puns, academic knowledge, and comics, but I felt disappointed reading most of this book. It was an ambitious undertaking, and I think that I would have a difficult time finding much worth in any book that tried to shoehorn all of language arts, math, science, and social studies into its pages. There are a few graphic novels that I think would work excellently as textbooks, but they have much more of a focused topic. Off the top of my head, I can think of these in biology, world history, US history/government, World War I, and economics. The reviews I have read for this book have been, at best, very mixed. Kirkus Reviews summed the book up as "wildly uneven in execution." Nick Smith recommended the books for classrooms and libraries but also commented that "not every segment is a brilliant success." Gretchen Wagner wrote, "Most of the pieces I did find both engaging and informative, but others I felt took too much exposition to introduce characters and backstory before getting to the concept, and others I could not find the point at all (although they were fun to read)." Jacob Canfield eviscerated the book in his review, writing "Despite all the good intentions in the world, The Graphic Textbook is a waste of money and time. With only a couple exceptions, none of the comics in this book are worth reading for any reason, much less educational ones." A preview, teachers guide, and more information about Reading with Pictures is available here from its publisher Andrews McMeel. Would elementary students get this reference? Bueller? Anyone? Before I close out Will Eisner Week, I probably should talk about the book that is credited with popularizing the term "graphic novel." 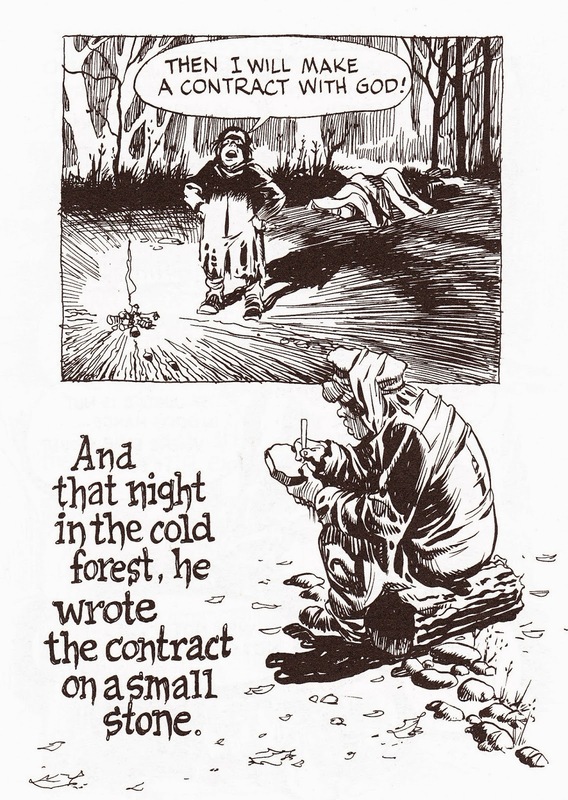 A Contract with God was Will Eisner's first attempt to publish a book of comics aimed specifically at adults. It eventually came out in 1978, well after Eisner had established himself as a comics creator (you can read about his career here), and it shows his literary aspirations. Ironically, this book is not so much a novel at all but a collection of four thematically related stories. Still, the term graphic novel still stuck, and the name gets used to this day when referring to all kinds of books that contain comics (I talk more about that point here). In any case, this book contains four stories. The first is the title tale, about a rabbi whose faith is tested after the death of his daughter. The second, "The Street Singer" is about a woman who used to be an opera singer trying to mentor a young man into a singing career. The third is "The Super," about an antisemitic building superintendent who finds himself the victim of crime. The last, "Cookalien" is a tale of some city dwellers vacationing in the Catskills. 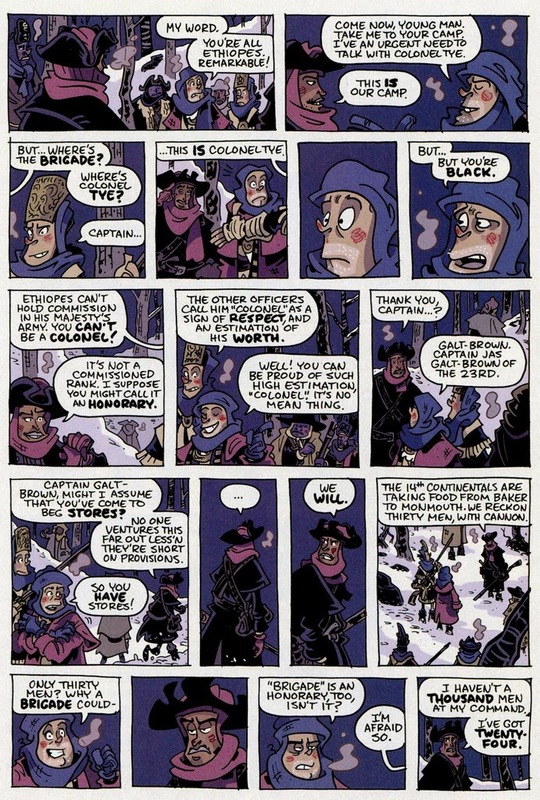 As you can see, none of the subjects of these stories were typical of the comics of the time, and this book marked a move toward telling a wider range of fictional stories through sequential art. Many have commented on the memorable, impactful comics in this book, though their mileage has varied. 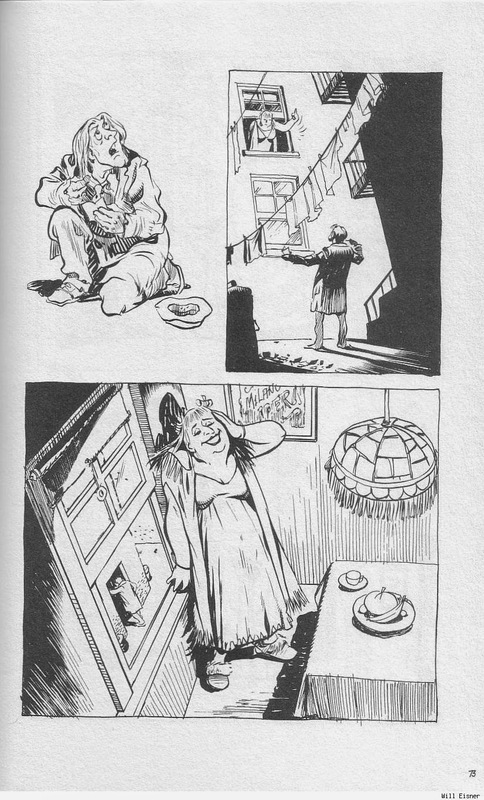 Peter Schjeldahl commented on Eisner's bombastic style and summed this work up as full of "cornball histrionics." Andy Shaw commented that "the book barely shows its age despite its venerable years." I am probably most sympathetic with Timothy Callahan who wrote, "Will Eisner may never be subtle, but he’s often unforgettable, and that’s as true here as it is anywhere." A Contract with God is currently published by W. W. Norton & Company, and they have a preview and more available here. Today, I review another graphic novel funded via Kickstarter for Will Eisner Week. Superbitch! is a superhero story turned on its head, a commentary on hero worship, celebrity, popular culture, and capitalism. Superbitch used to be a run of the mill superheroine, but she decided that charity work was for suckers and that she should get paid for her services. She is petty, materialistic, drinks maybe a little too much, and solves her problems by punching them dead in the face. The two main members of SB's supporting cast, who try their best to ground her, are Art Hobo, a childhood friend who has a bachelor's degree in art and a lot of debt, and Quinn, a smart computer expert who keeps her up to date with technology and pitches in as needed. But after a few pages, you can see a distinct and cleaner art style evolve. Also, there are more sustained storylines, where Superbitch runs for mayor, deals with a jerk of an ex-boyfriend, and assists Art Hobo when a super-powered debt collector comes a-calling. I really enjoyed these comics, particularly how they play with and ridicule the often ludicrous conventions of superhero comics. Superbitch! creator Kennedy Cooke-Garza is a recent graduate from the Savannah College of Art and Design. She has an online portfolio of her artwork and various projects here. For those interested, she talks about "comics, superheroes and creativity" in this interview. I was only able to locate a couple of reviews for this book, and they were both positive. Brian Cronin had these positive words for the comic, "Cooke-Garza is a talented draftswoman, and her work has only gotten better as the series has gone along." Deborah Markus wrote on Goodreads, "It's ridiculously over-the-top wrong, and it kills." 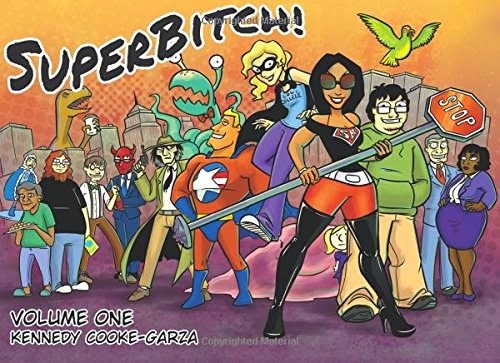 If you are interesting in buying this book or following her continuing adventures, Superbitch! is regularly updated here. Also, as you can see from the title and the sample pages, there are frequent profanities and adult situations, so this book is recommended for those mature enough to handle both. Will Eisner Week Day 5 brings us to a book by an established graphic novelist. 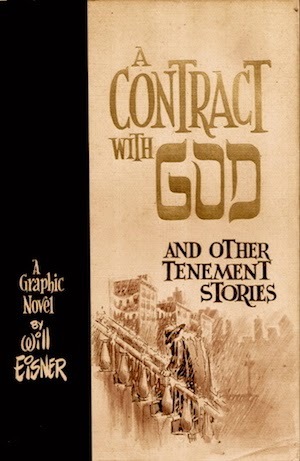 In part I chose this book because it shares at least one theme with Eisner's first graphic novel, A Contract with God, in that the main character struggles with his religious faith. Eisner's book was not so much a novel as a collection of stories, but this one here is one continuous narrative. 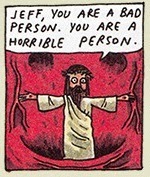 Even though he is not so old one could call Jeffrey Brown an elder statesman of autobiographical comics. He has written and drawn a slew of them, including Clumsy, AEIOU, Unlikely, and Every Girl is the End of the World for Me. He also has created a number of fiction works, including his Sulk series, the Incredible Change-Bot books, and his forays into the universe of Star Wars. Many of his highly confessional autobiographies deal with his romantic relationships, but this one here, A Matter of Life, is about his family, fatherhood, and his religious faith. But this book does not just focus on his growing up, it also bounces around to other points in Brown's life and we see him as an adult and as a father to his own son. It has comic scenes, like the one with a literal tiny Jesus raging in a heart, and sweet scenes, like the one where his young son pays his mom an unexpected compliment at the dinner table. Perhaps the most impressive thing about this book is how well it balances and juxtaposes these various tones and emotions. Although the book works organically as a whole, I also admired how it is both episodic and non-sequential. There are so many great tidbits and glimpses into Brown's life, but they are not necessarily told in chronological order. I appreciated the way he tells his tales thematically in a relatively novel way. All of the reviews I have read about this book have been full of praise. Jody Arlington wrote that "you'll be inspired by the Brown family's goodness and gentle relationship with each other and the world." Publishers Weekly commented that the book was full of "subtle and quiet insights into the realities of family life." Bill Sherman called it "challenging and sweet" and also "a wonderful testament of the ways that comic art can look beyond the trappings of genre storytelling." And for those interested, Brown speaks more extensively and specifically about his work on A Matter of Life in this interview. 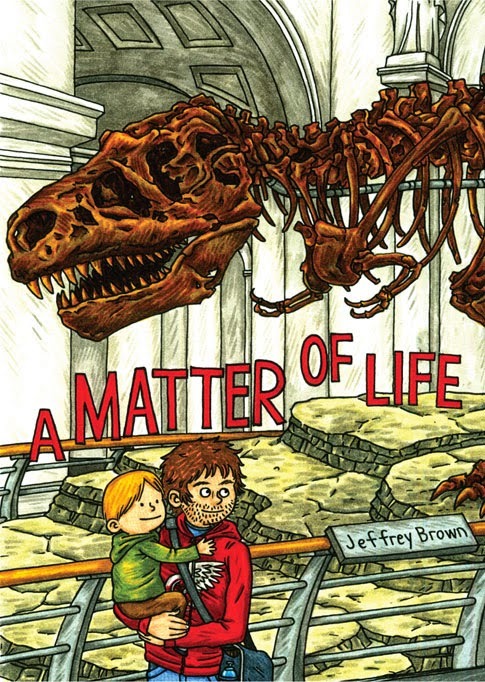 A Matter of Life was published by Top Shelf, and they have a preview and much more information available here. 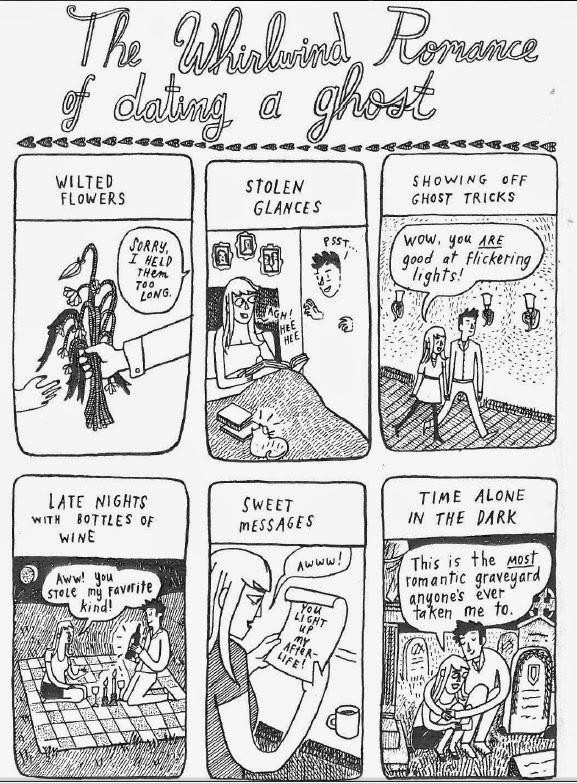 Will Eisner Week day 4 has me looking at a graphic novel that is a compilation of mini-comics. The main character is Gemma, a nurse in training who has to deal with some pretty competitive fellow nurses. She starts out on Venus, but ends up on Mars and beyond. She has so many episodes but they are all pretty light and fluffy. Additionally, her adventures are dreamlike and random, but there are lots of fantastical features, such as deer wearing space helmets, space pirates (one who dresses like a panda), a cosmic band of musicians, an evil ex-boyfriend, weird television commercials, a mischievous three-eyed squirrel critter, and butterflies that pack an aphrodisiac punch. I was impressed with the imaginative range of character design and world building throughout. And although I enjoy the narrative jaunts, for the most part they are pretty loosely tied together. The real star for me here is the pictures. I very much enjoy Skelly's art style, with its 1960s psychedelia, flourishes in lettering, tiny details, eruptive images, and clean, flowing linework. The whole book crackles with a fun, exciting energy. Reviews I have read of the book have been mostly positive, though some offer reservations. Rob Clough wrote of it, "The overall effect is a breezy, lighthearted, relentlessly strange and amusing narrative that must be accepted by the reader on its own terms." Suzette Smith called it "an amazing exploration of the experience of a modern liberated woman in space." Sean T. Collins marveled at the "endearing cartooning style" and strong character designs but in the end felt let down by the incomplete, somewhat rushed story. 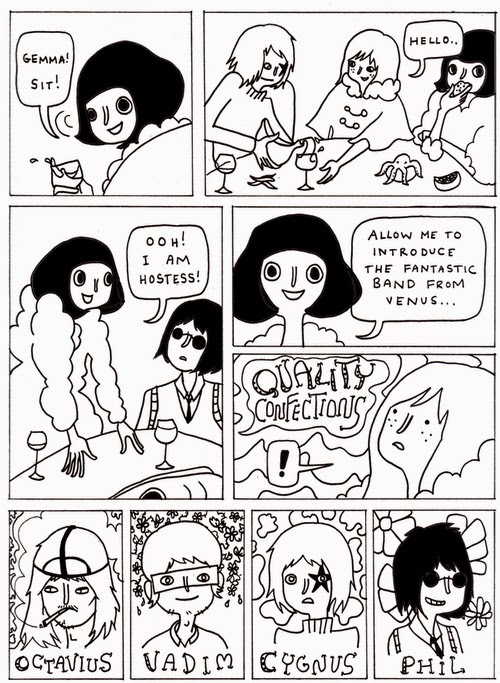 If you like Skelly's comics here, you might also want to check out her other mini-comics collection Operation Margarine. 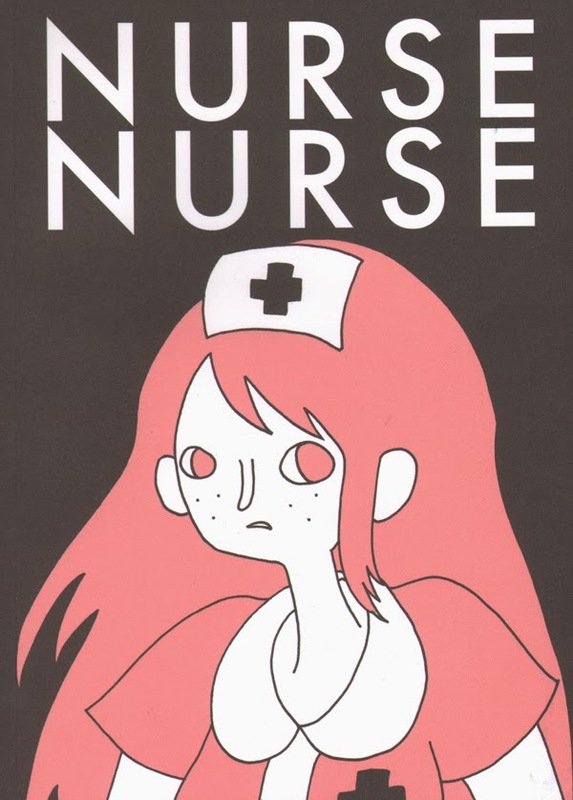 Nurse Nurse is available from Sparkplug Books. Will Eisner Week is rolling along to day 3, where I am reviewing a graphic novel funded in part by Kickstarter, a new-fangled, crowd-sourced method of gathering money to bring a project to fruition. Which gives you a sense of the timing and humor in this book. Anyhow, once Shane is a free man, he decides he wants a quiet life as a florist. Things are going well until one day the local muscle comes by the shop looking for "insurance money." My favorite line in the whole book. Needless to say, Shane makes short work of the goons, but the local crime boss decides to sic the team of assassins Shane used to head on him. If you watched any movies from the 1980s at all, you recognize most of these faces. So the rest of the book is basically the same plot as Road House, only with way more jokes and way less of Patrick Swayze's abs. There is a whole lot of mindless violence in this book, but it is also played mostly for laughs, and there are a few scenes that are surprisingly heartfelt. I am super impressed by how fun and raucous this book was. 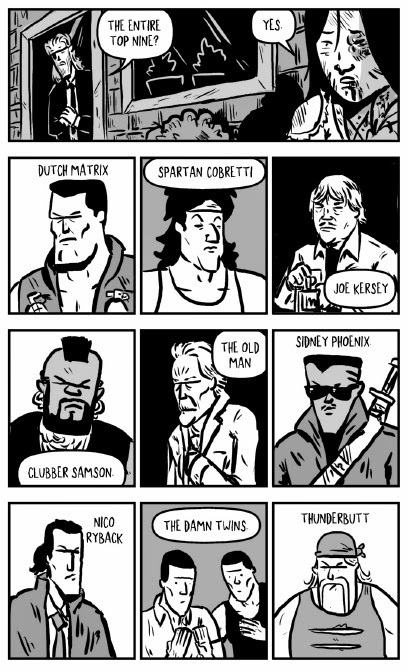 I would also say impressed, but Kyle Starks' last book The Legend of Ricky Thunder is one of my all time favorites. After my experiences with all of his books and mini-comics, I am pretty much set to buy anything he creates sight unseen. 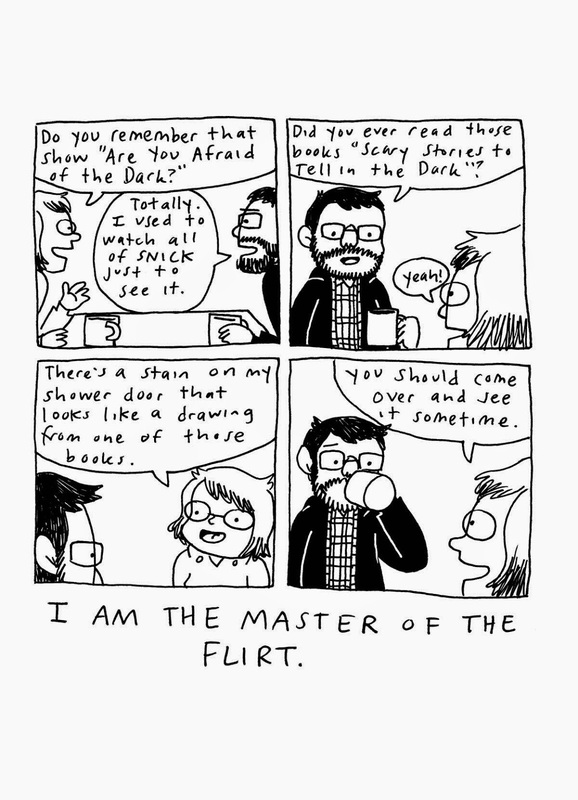 The man is a masterful entertainer, humorist, and comics maker. All of the reviews I have read about this book have been extremely positive. Rich Barrett wrote, "This is a laugh-out-loud comic from a real rising talent." Kyle Overkill added that it "provides a lush experience whether it be the humor, the action, plot, characters or a man befriending a polar bear." Matthew Meylikhov lauded, "It’s fun, it’s incredibly funny and it has a surprising amount of heart at the center of it." 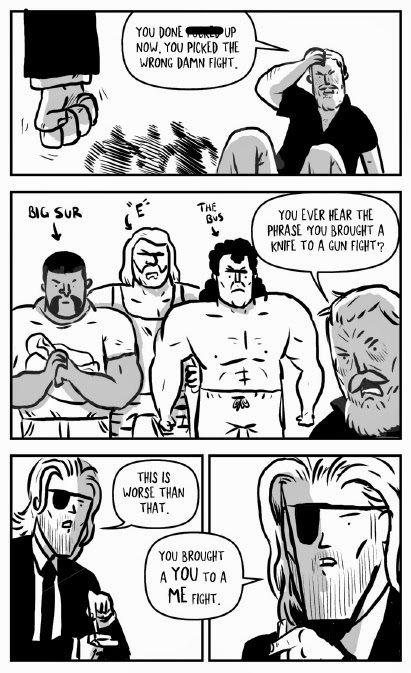 And if you are interested, Starks speaks more about his work on Sexcastle in this interview. Sexcastle is published by Image Comics. There are profane language and violence throughout, so I recommend this book to readers mature enough to handle both. 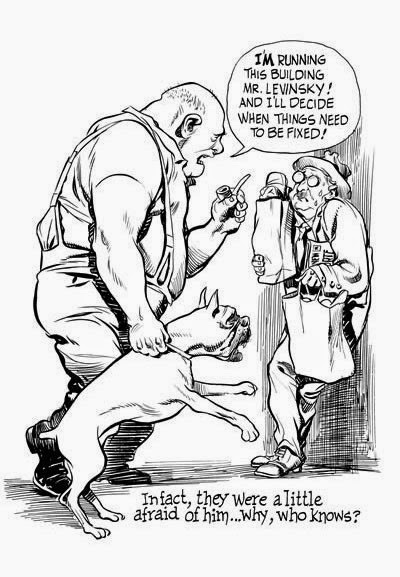 Happy Will Eisner Week, Day 2: Get Over It! Day 2 of Will Eisner Week has me reading a graphic novel from a creator whose works in mini-comics are among my favorites. 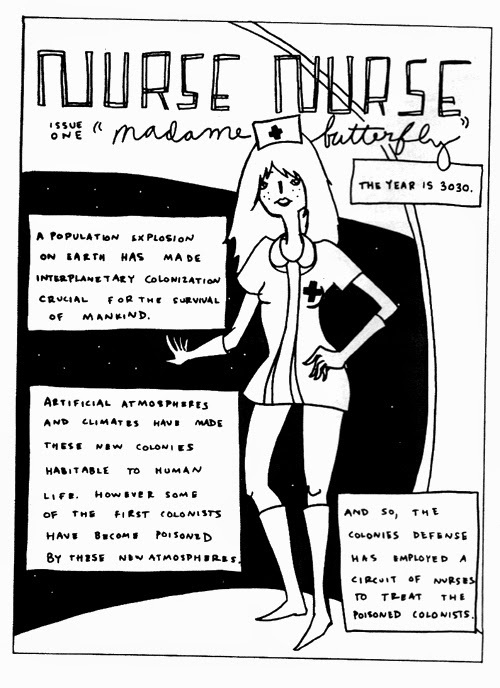 I am a big fan of Corinne Mucha's publications, and I have featured her first graphic novel Freshman on this very blog. 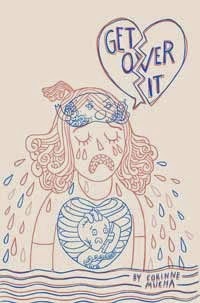 Her second one, Get Over It, is aimed at a more adult audience. It is about dealing with the fallout of a break-up, and it is at once bittersweet and entertaining. Part of what makes it work as well as it does is Mucha's sense of humor and her unique way of depicting the jumble of emotions and behaviors that follow. For instance, parts of the narrative turn into small vignettes or quizzes that highlight some pretty horrible moments. All of the reviews I have read about this book have been positive. Megan Kirby commented, "Mucha’s constant use of wordplay, gags, visual metaphors, and childlike flights of fancy give her a self-aware edge." Tim O'Neil summed up that she "managed to turn her pain into something heartfelt and compelling, which is no small feat." Zainab Akhtar called her a "well-kept secret" and wrote that "Mucha maintains the auto-biographical sweet-spot, maintaining a balance between the personal and involved, without descending into narcissism, whilst hilariously dredging through the universal impulses and emotions of the post break-up period." Get Over It was published by Secret Acres, and they provide a preview and more info here. Because I love Mucha's work so much, I also bought and read this mini-comic, The Girl Who Was Mostly Attracted to Ghosts. 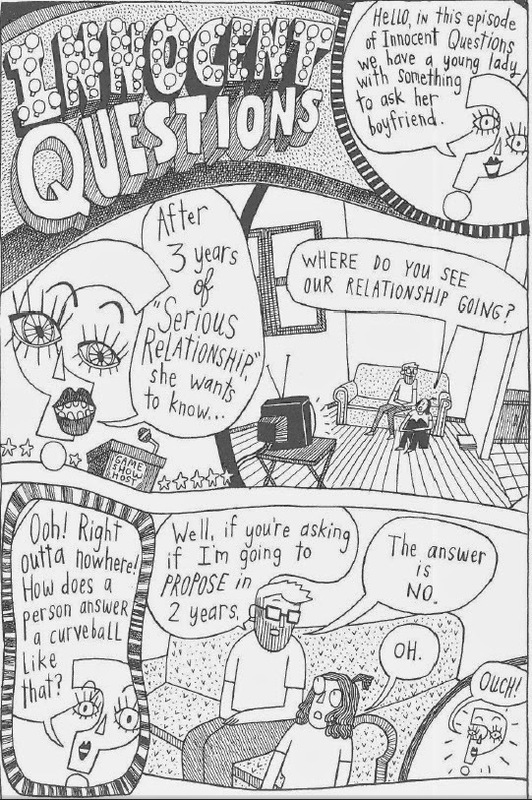 It is also focused on relationships, in particular on a woman with a peculiar love-life problem: she apparently only wants to date unavailable guys. Mucha takes things one step further and just turns them into phantoms. Certainly, there is a lot of metaphor going on here, but I love the playful way that the narrative is fast and loose about shifting from fiction to reality and back. 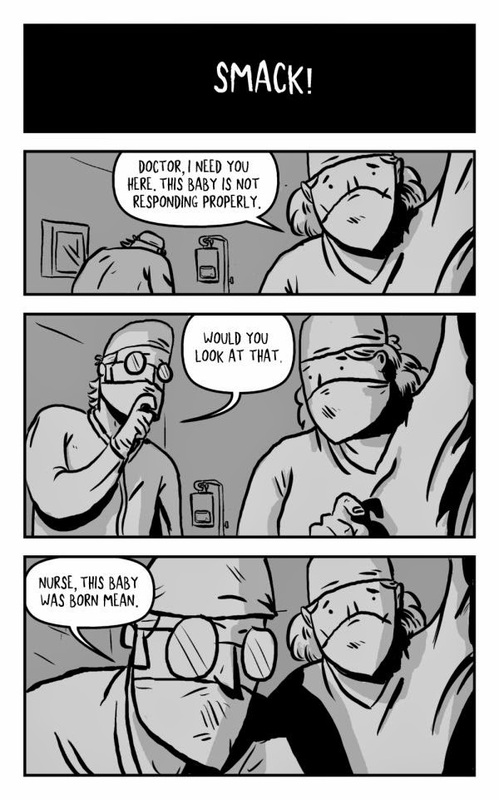 This comic is not just a one note comedy, but a human story that is deeper than it would seem at first glance. I really admire how Mucha can make me alternatively laugh, think, and feel with her works. The illusion of simplicity in her work relies much on craft and forethought. Personally, I am very into her works. If you would like to learn more about her, Mucha speaks extensively about her works and comics career in this interview. 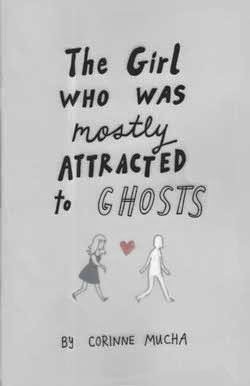 The Girl Who Was Mostly Attracted to Ghosts was also published by Secret Acres, but it is now out of print. This year's theme for Will Eisner Week is "Read a graphic novel." So in honor of this event, I am going to review a different graphic novel each day this week. 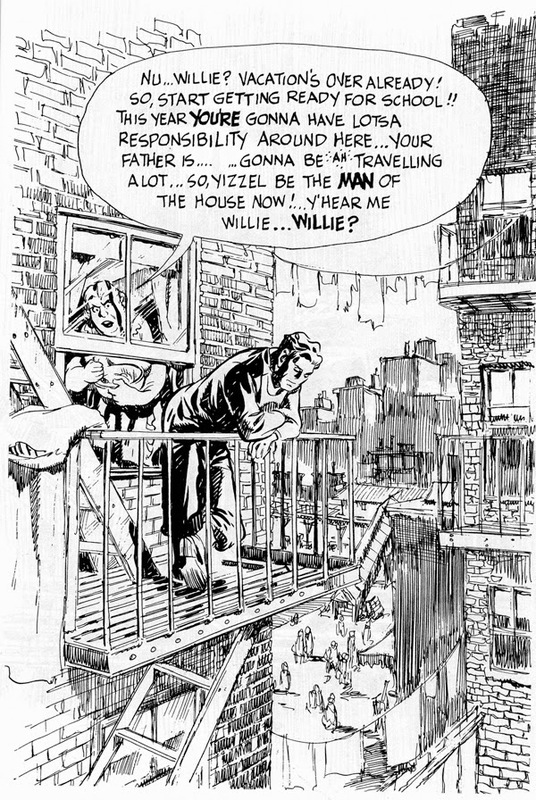 Will Eisner is credited with popularizing "graphic novel" as a term in his aim to publish (you can read more about the matter here). The legend is that he approached multiple publishers for his book A Contract with God and could not get his foot in the door saying he had a comic book for adults, so he shopped around a "graphic novel," and eventually he was successful. 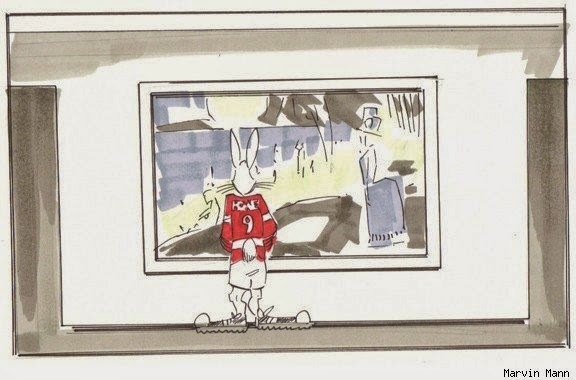 I am honoring his work to publish new forms with a look at a relatively new venue for publishing, webcomics. 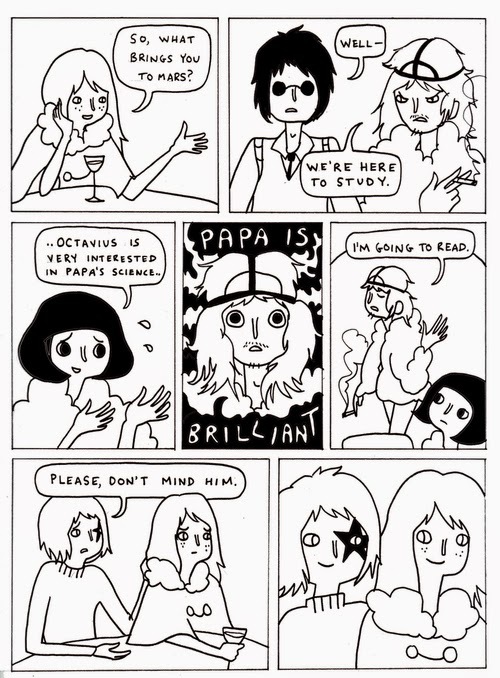 Cochlea and Eustachia is a author-produced work that was taken up and printed by a major alternative comics publisher, Fantagraphics. Creator Hans Rickheit wrote on his website that this work "will be completely unencumbered by tempo, character development, plot, or logic." I would not go quite that far, but the adventures are pretty surreal, grotesque, and compelling. The book follows the exploits of two blonde females who wear domino masks, tops, and nothing else. Are they friends, sisters, or something else? I have no idea. But they are mischievous, not completely human, and they find themselves in mysterious circumstances. They are often pursued by weird creatures, like a mole-faced scientist or a giant chicken skeleton or a troublesome clone. The book has its own compelling logic, which thematically reminds me of a combination of Jim Woodring's dreamlike worlds and Phoebe Zeitgeist's random, titillating tribulations. Hans Rickheit is known for his prior work on the Xeric Award winning Chloe and his graphic novel, The Squirrel Machine. As you can see from the excerpt above, his art is full of clean lines and well rendered images. 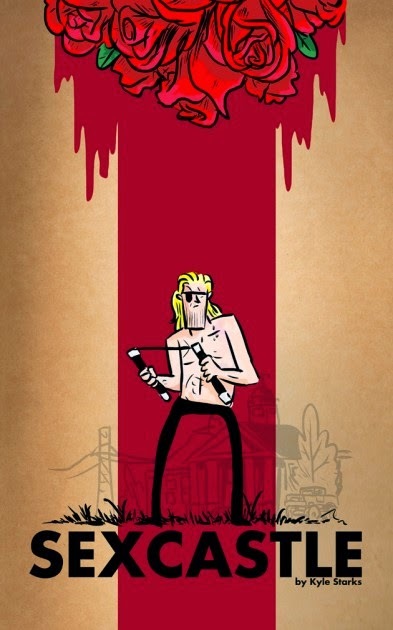 His balance of cartoon and reality makes his surreal stories even more affecting and disturbing. The reviews of this book I have read tend to be on the positive side. Jason Sacks called it "a hauntingly lovely creation." Publishers Weekly summed up, "It’s deeply disturbing, and that’s just what was intended." Zack Hollwedel concluded his review, "The book won't be for everyone—in fact, it probably won't be for most—but this off-the-beaten-path tale fills a definite, albeit small, dark and fetishized niche." This might not be a book for everyone, but its existence points to the grand result of Eisner's work, that today graphic novels of all sorts are being published. What was once a highly marginal text format now has much more status than ever before. Cochlea and Eustachia continues as a webcomic. This edition was published by Fantagraphics, who have a preview and more here.